Big Hunk Candy Bar. Big Hunk candy is chewy nougat candy bar filled with whole roasted peanuts. With every bite of a Big Hunk Bar you get a sweet, chewy pea-nutty taste. Each box has 24 2 oz bars. Not only that but for those of you who watch your weight the Big Hunk only has 3 grams of fat. 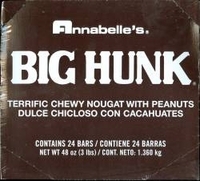 Back in the day "BIG HUNK" was my favorite candy. On occasion I would stop at the "Osage Market" on my way to school and purchase one of my favorite bars. However, one such occasion has been cemented in my memory. On this particular day I was running a little late but I still wanted to get something to eat before school. I went by the grocery and purchased a "BIG HUNK" and hustled off to school. At this point, I was completely unaware of the strange fortune that was about to befall me. Because I was running late I did not have time to finish my candy prior to walking into the building. Now anyone who has ever eaten a "BIG HUNK" knows the process that is involved in consuming such a product. Having more than one bite in your mouth at one time can produce prodigious amounts of saliva. The longer you let the bar sit in your mouth the more the flavor develops. So that day just before I passed through the outer school doors, I stuffed the last 1/3 of the bar into my mouth. I was hoping that I could cruise to my locker and enjoy this mouthful of candy, uninterrupted. As fate would have it, that was not the case. No sooner did I walk through the door, than there staring me down was Sister Helen Marie Blaugh. Sister Helen Marie was a notorious villain at our school. She was a cousin to the Bishop and she ruled everyone and everything at our school. Even the superintendent feared her. She was secretly referred to as Sister Helen Wheels. Sister Helen Wheels immediately began to quiz me about an English paper that was due the day before. I had a complete explanation regarding my paper. However, I was unable to say anything, for fear that she would discover that I had a mouthful of candy which was strictly against the rules of my private Catholic school. I knew if she found out I was eating a candy bar, I would probably have to stay after school for at least a month. Nothing short of a miracle was going to make me give up my secret. And for that matter the flavor of the candy was unbelievable by now. As Wheels continued to question me, I stared back with a dumbfounded look, not uttering a single word. The volume and intensity of her interrogation was rivaled only by the volume of saliva and the intensity of the flavor of the candy in my mouth. Soon, she began to scream repeatedly "answer me boy". The next thing I know, she hauled off and punched me right in the kisser. This was not an unusual occurrence for a parochial school nun back in the sixties, and definitely not unusual for Sister Helen Wheels. In fact, she was well known for striking boys and girls alike, at times with whatever object she happened to be holding at the time. Now I have been punched many times since that day, but never with such explosive consequences. From the beginning to the end, I probably had the candy in my mouth over 3 minutes. As the candy began to dissolve, my mouth was like a churning caldron full of the sweet nougat flavor. When I got punched, about a pint of saliva exploded back in the face of the crotchety old nun and anyone who was standing within 10 feet. Immediately, I fell to the floor and began to choke. And Sister Helen Wheels took off to the bathroom to clean up her habit. As the story unfolded, I was at school and wasn't feeling very well. Sister Wheels caught me at the door and didn't give me time to explain that I had the flu. She simply was overcome with anger and hauled off and punched me. I was never caught with the candy and within a month Sister Helen Wheels was sent to the retirement home in Kentucky. That's the truth!!!!! I Swear on a stack of Sister Helen Wheel's bibles.